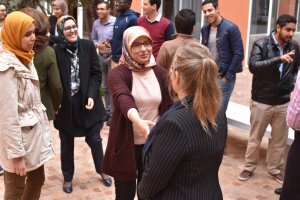 Climate Interactive’s Agriculture team recently held a successful workshop on systems thinking and system dynamics at the campus of our partner Mohammed VI Polytechnic University (UM6P). 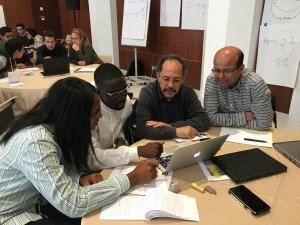 Over 30 participants – representing the University of Ghana and the private sector as well as students and faculty from UM6P – spent five days building models and participating in learning exercises. 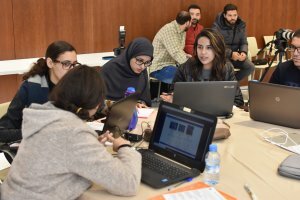 Led by consultant Rebecca Niles, Skuk Jones and Travis Franck of Climate Interactive, and Professor Saad Benjaloun of UM6P, participants progressed from system thinking basics to building their own models. Each day included an immersive exercise or game that provide a novel insight into complex system behavior. The insight was then the basis of model building that day. Participants analyzed the dynamics uncovered by each exercise, explored the general lessons of similar systems, then constructed formal models in Vensim software. Exercises included Climate Interactive’s flagship World Climate negotiation exercise and a beta-test of our new agriculture-focused exercise based on our Agriculture and Land Policy Simulator. By the end, participants were constructing models based on their own experience and discovering new insights. The response was enthusiastic. Participants cheered each other as they accepted their certificates. Over half of them expressed interest in a follow-on workshop. We expect that this will only be the start of our capacity building at UM6P. To learn more about Climate Interactive’s Agriculture Program, or to help us envision the future of food security in Africa, contact Travis Franck.